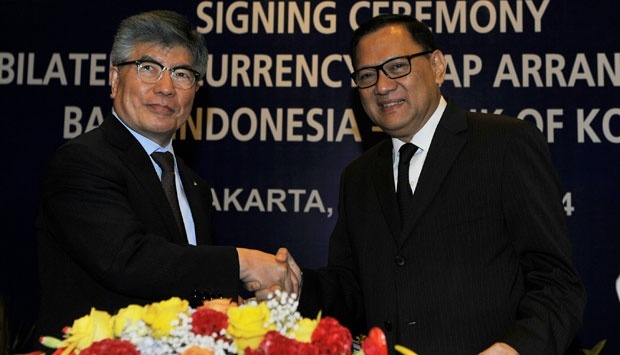 TEMPO.CO, Jakarta – The rupiah is expected to gain power against the US dollar after Bank Indonesia (BI) signed a Bilateral Currency Swap Arrangement with South Korea. “The swap will reduce pressure on rupiah,” Bank Internasional Indonesia (BII) chief economist Juniman said on Thursday, March 6. The agreement was signed by BI Governor Agus Martowardojo and Bank of Korea Governor Kim Choongsoo yesterday. This cooperation enables up to US$10 billion worth of local currency swaps between both central banks worth. The agreement is valid for three years and can be extended with the approval of both parties. The main purpose of this bilateral swap is to promote trade and to strengthen financial cooperation between Indonesia and Korea. In particular, this agreement will ensure the settlement of transactions in local currency between the two countries–even during monetary crisis. “This agreement represents a commitment between the two central banks to support regional macroeconomic and financial stability in the face of high global uncertainties,” Agus said yesterday. In addition to lowering the demand for the US dollar, Juniman said the agreement will strengthen the economies of both countries. “Especially Indonesia, it will serve as additional ammunition if BI’s reserves are depleted,” he said. Universitas Indonesia (UI) economist Lana Soelistianingsih forecasted that the rupiah will continue to be appreciated in the next six months. However, she suggested the government keep a full eye on the increased volume of imported goods. Theoretically, rupiah can strengthen to a range of Rp11,300 to Rp11,800 per US dollar. With a heavy flow of foreign portfolios into the country, the exchange rate could even penetrate down the Rp11,300 per US dollar level. As of today, rupiah stands at Rp11,554 per US dollar.